Kydex holsters are the preferred choice of many carriers of concealed weapons due to their combination of functionality and comfort — and the fact that the waterproof Kydex material will not shrink or rot. Gun owners also like how Kydex holsters enable them to keep their weapon close to the body, making it easier to hide under clothing. Belt Loops: You'll find polymer belt loops in 1 1/2" and 1 3/4" sizes that are compatible with Kydex holsters. The polymer plastic material is durable and easy to clean. 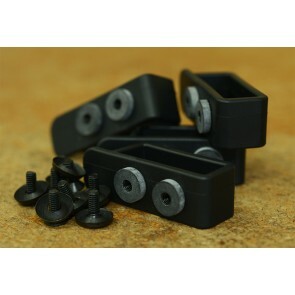 We sell these as a set of two belt loops that comes with all the hardware you need for fastening includes rubber grommets, screws, washers and screw posts. 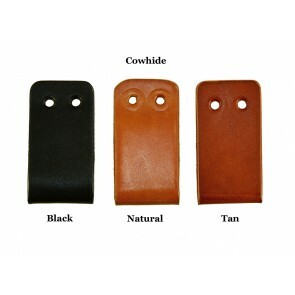 Cowhide Straps: We offer beautiful cowhide straps in your choice of natural, tan or black. 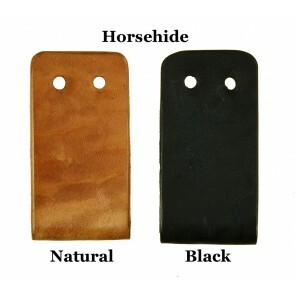 Horsehide Straps: If you prefer horsehide straps for your Kydex holster, we have them available in natural and black. Embossed Straps: Our embossed straps will add a touch of style to your holders. We feature these leather straps in tan, black and natural color options. 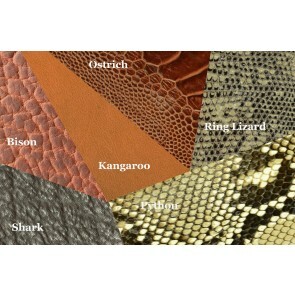 Embossing design choices include Big Crocodile, Little Crocodile, Shark, Ostrich, Python and Bullfrog. 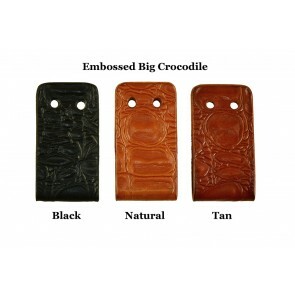 Exotic Straps: If you're looking for something a little more flamboyant in a holster strap, you need to check out our selection of Bison, King Lizard, Python, Ostrich, Shark and Kangaroo offerings. All straps are available in quantities of one, two or three per package. Ever since we started High Noon Holsters more than 20 years ago, we've focused on offering high-quality products that exceed the expectations of our customers. Our assortment of Kydex parts will deliver unmatched reliability and durability, giving you many years of dependable service. Whether you're a new gun owner or a long-time carrier, you'll find the right Kydex part at a fair price. Our revamped e-commerce site makes it simple to find and purchase Kydex parts. Just select the items you wish to buy and add them to your shopping cart, then complete the user-friendly ordering process with your preferred payment method. You'll also appreciate our speedy delivery — most in-stock items ship within one to five days. If you have questions or need assistance, feel free to give us a call or send us an email. With our top-notch customer service, the help you need is always available. And with our unique satisfaction program, you can be sure we'll do whatever it takes to make you a happy customer. Please take a few minutes to check out our current inventory of Kydex parts and place your order today. If you can't find what you're looking for, just let us know, and we'll do our best to accommodate you. Make High Noon Holsters your single source for all your gun holster and holster accessory needs!